New Warri is the name given to the new areas that have developed and joined the main Warri. This publication takes a peep into the ten most popular areas and communities that form the new Warri but there are several areas which are not captured in this article. 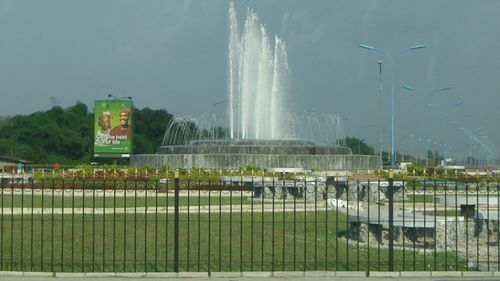 Warri is the main business hub in Delta State and one of the foremost cities in Nigeria. This is an established fact that you already know. But Warri as a place or a people is quite small in landmass and size but it makes the loudest noise when it comes to comedy, entertainment, and sports. It is normal for every developing city to grow and expand with development cutting across the different communities that are around. In this publication, we take a look at some of the different communities that have developed and have become part of Warri as a city. We have focused this article on the recent communities which have developed themselves and are now part of the main Warri. These communities offer a lower standard of living as compared to the main Warri hub. The list below captures the most popular and most populated ten communities around. Ubeji is really something because it is the residence of some the richest Itsekiri’s. Warri billionaire Ayiri resides in Ubeji. Nigeria Gas Company and Warri refinery Petrochemical Company are partly situated in Ubeji which gives Ubeji an edge over many other communities. And not forgetting the Deeper Bible Church Regional Camp Ground in Ubeji. Ubeji tops our list as one of the foremost areas of the new Warri era. Ugbromro is another community in new Warri because it is just after DSC roundabout and it can be accessed from two main points. It has access roads from along DSC expressway and also from Okuokoko. Ugbromro is the kick of site of Federal University of Petroleum resources which makes it very busy at the moment with development growing rapidly in that area. Ugboloposo is quite unique because of the speed at which it is developing and it is strategically situated because it has two main access roads which are through PTI road and through DSC expressway. The prices of land is appreciating daily and I bet you the prices of houses are competing with that of the main Warri and people do prefer to reside in this environment because it is purely residential by design but there are a few companies present in this community. Ugboloposo has a community market and it is still 5 minutes drive from Effurun market which is one of the busiest and biggest markets in Warri on their market days. Osubi is quite a unique place because it is just 5-10 minutes drive from PTI Junction which makes it part of the new Warri. Osubi airport puts Osubi in Warri map because of tourist and travelers must come through Osubi Airport. Osubi is basically a residential area because the major company you find there is just the airport. Otokutu community is off DSC expressway and it is 15 minutes drive from Effurun roundabout which is strategically located. From Effurun roundabouts, you have roads that connect with every major area in Warri. Otokutu community is relatively peaceful, and it is positioned in the middle of DSC expressway which makes the community quite accessible to people who work at DSC, Udu, Uti, PTI, etc areas because the community is about 10 to 15 minutes drive to the areas mentioned. This is already a part of Warri because of its location and the caliber of people living in this area. This community arguably is one of the foremost communities that are formed the new Warri era. You have the NPA, Intels, Warri Central Hospital and Warri South LGA and other government and private organizations are close to this community. It has link roads to the heart of Warri and to Airport road and Ogunu. Jeddo Community has a unique story because it is 10 minutes drive to Warri Refinery and Nigeria gas company, 20 minutes drive to Delta Mall and Effurun roundabout and Warri main market. Accommodation is quite cheap and the overall cost of living but you will always go out to main Warri for major bank transactions and for largescale buying. There are several POS machines, Restaurants, and a fairly medium market in Jeddo. Jeddo is the perfect residential area if you are looking for life outside the ever-bubbling Warri. Jeddo is the new Warri if you need to get some quietness after the busy day at work. One unique thing about this community is the stability of power supply. Some welders, tailoring shops, frozen food shops do not have generators. The stability of Power supply makes the community quite popular in Warri and it is easily joining itself to the new Warri. Ughoton community is five minutes from Jeddo and that makes it a plus because within 30 minutes you can be anywhere you want to be in the main Warri hub. The community is one of the safest places in Warri because it has an army checkpoint, local vigilantes, a police small station, and the indigenes of the host community stay a little bit far from the residential areas. You have other little communities around like Ugbokodo, Omadino, and Obodo which are purely residential areas. Jeddo and Ughoton have one link road which is the only minus in both communities. Mami market is arguably part of the new Warri era because of how it is strategically positioned. It is very close to the Effurun roundabout, the military base, naval clinic, and Delta mall. Mami area has expanded and it has a Mami extension because of its closeness to the roundabout and the Effururn spare part market. Okuokokor is a community that is between DSC roundabout and Agbaro. Development has hit this community so much that it has boundaries with Ugbromro, Osubi and it location makes it one of the busiest roads because it links Ughelli and to the south-south states. The 10 communities listed in this article are not all there is and the list does not follow any particular order of importance. These communities forms the new Warri because when people tell you they stay in Warri they just might be staying in one of these communities but the pidgin and accent may differ slightly but you will still get the Warri flavor from anyone staying it these communities.